Who doesn’t love dinosaurs? Also, who doesn’t love robots? These are serious questions for our times and if you’re on this site I have to assume you have at least a passing interest in both. With Jurassic World: Fallen Kingdom in theatres and the announcement of LEGO Ideas Voltron yesterday, I’m in the mood for these two flavours even more than usual and this definitely gets the peanut butter in my chocolate. I’ve quite enjoyed the Nexo Knights theme and part of that is the colour scheme you see here. The design of the beast is the star here and I love the chunky yet smoothly rounded segments on the dino. The shaping and parts usage on the head is great too. I get kind of a Grimlock vibe from this guy and that’s not a bad thing in anyway. 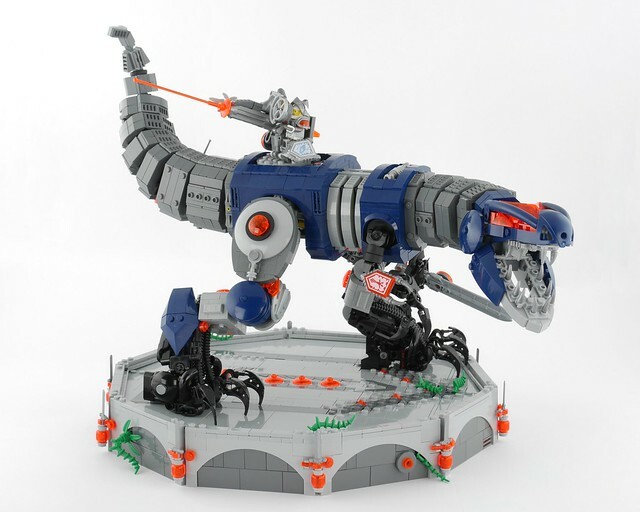 I’d take a LEGO Grimlock any day of the week, but for now I’ll settle for this bad boy.